Due to recent veterinary bills with painful numbers on them, I have decided to open myself up to knitting commissions. I have taken them before and I will say up front they’re not my favorite thing. However, I won’t lie or offer you false humility – I’m a damn good knitter. If I knit something for you, it’s of the highest quality and will last a lifetime given proper care. I don’t offer commissions lightly or as inexpensively as some. 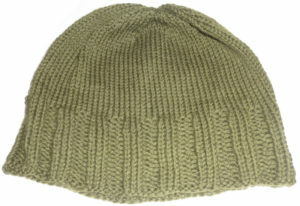 I’m sure you could find twenty or more people who will knit you a basic watchcap for under $20, but I am not one of them. Having said that, I will tell you right now the prices you’ll find below are quoted at a VERY deep discount. Take a look at this post for a longer explanation of why I price things the way I do, and you’ll see what I mean by discount. Disclaimers out of the way, let’s get down to business. 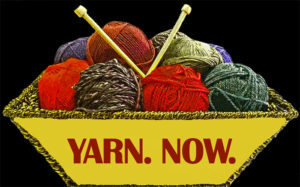 All prices quoted using current 100% wool yarn costs. Prices will vary if another fiber is desired (such as alpaca, cashmere, mohair, or acrylic/washable blends). Pattern examples below. Whatever you choose will be done in the color(s) of your choice unless otherwise noted. Two colors maximum per item unless otherwise negotiated. You might get a bookmark. You might get a cat toy. You might get a washcloth. My choices, my yarn. Kick back and let me do my thing. This option is for the brave or the nonchalant. Give me $20 and the colors you like and I’ll knit you something random from the yarn I already have. 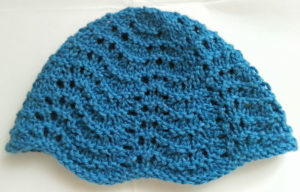 Small, close-fitting skull-cap in a feather-and-fan pattern. Smaller fit. Can be scaled up for larger heads. 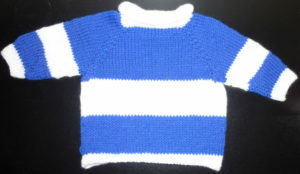 Available in sizes from 3 months old to larger adult. Thick, warm, reversible. Matching hat can be added for additional $25. This pattern can be customized for school sports teams or any color combination you choose. 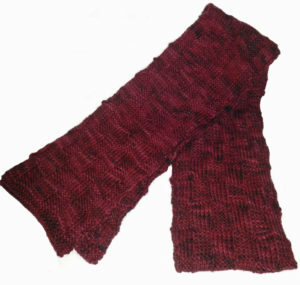 You can see other examples of my work on Ravelry here. 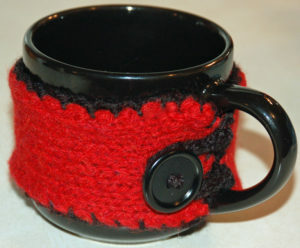 If a custom pattern (sweaters, shawls, blankets, toys, Christmas stockings, etc. – anything you don’t see here) is desired, contact me for a quote. Please note: No Fair Isle, entrelac, or complex cabling will be considered for commission. Simple cabling is accepted. Time of delivery will vary upon complexity of the project and your place in the queue*. 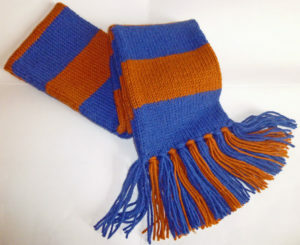 Example: A wizard scarf takes me about 90 hours to knit. If I knit on it two hours a day, it will take me six weeks. If the project in front of yours is also taking six weeks, such as a sweater, you’re going to have a bit of a wait on your hands. Handmade knitted items take time, and that requires patience. Feel free to email me about the status of your commission any time. *If you need your commissioned item by a certain date (birthday/holiday/occasion), a negotiated rush fee may be applied depending on availability. Shipping: $5 flat rate included in package price for United States. International rates vary. Contact for quote. Refund Policy: If I cannot complete your commission for any reason, I will offer you a full refund. If you cancel your commission after I have already purchased any materials it requires, I will refund you the balance minus the cost of said materials.